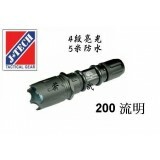 ◎Ultra bright CREE LED flash light was designed specially for military / Police tactical duty. rail system for both carbine and rifles. Material: Aircraft grade 6061 aluminum. This Product was added to our catalog on Sunday, 20. September 2009.